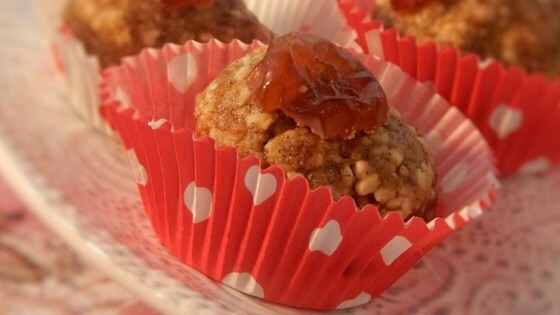 "This is my copycat-version of a bliss ball that I discovered at a local juice bar. These little guys taste amazing! They're raw, vegan, gluten-free, and fabulous. Maca root is a powerful superfood! These little bites pack a wallop and taste phenomenal! Kind of like a cardamom-laced salted caramel snack. Enjoy!" Put cashews and salt in a food processor fitted with the S-blade; pulse until cashews are finely chopped but not a paste. Add dates, maca powder, cardamom, and olive oil; blend until mixture is evenly combined and holds together. Shape mixture into 10 to 12 balls and refrigerate until firm, at least 30 minutes. If you have cashew meal, you can substitute that for the cashews and save yourself the step of grinding cashews. They should last at least a week, unless you eat them all first! They also keep well in the freezer. Just thaw for a few minutes before eating. I will make these again, but I will definitely dial back the cardamom, maybe just to one teaspoon. It was way too strong for me and almost tasted like a mouthful of perfume.